All transactions are safe and secure with a reliable history in online purchasing behind each of our associates. 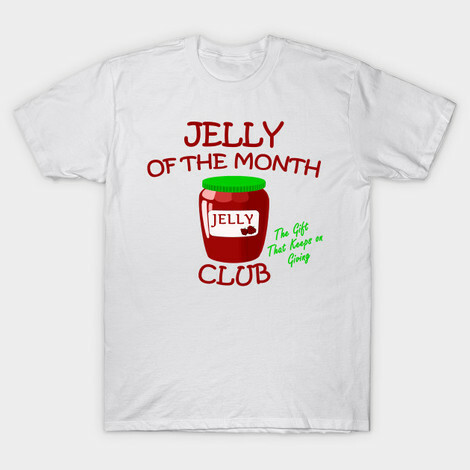 Buy the Jelly of the Month Club t-shirt to own Christmas Vacation clothing and merchandise. Clark daydreams about what he is going to do with his Christmas bonus. After all, this year should be bigger than last since his non-nutritive cereal varnish was a huge success. For the benefit of the family, he decides that he is going to put in an in-ground swimming pool. He has even put a deposit down on it. When his bonus arrives a day late, he is shocked to discover that it is for a one year membership to the Jelly of the Month Club. Support the gift that keeps on giving with a Jelly of the Month Club t-shirt. In addition to the Jelly of the Month Club tee above, browse the Christmas Vacation Clothing Gallery for more apparel like men's and women's clothes, kids shirts or hoodies.